Last time, we made a new directory. But there are also other operations that we can do with directories, not just making a new one. In this tutorial, our main task is to display a message box with the names of all the items in the current directory, with each name having its own line. Windows provides us with API functions for tasks like that too. Let's quickly go over the Windows functions that we would use. Used for starting a directory scan. The directory or path, and the filename (wildcards are allowed). A pointer to a WIN32_FIND_DATA structure that receives information about the first item (ie file, folder, etc.). The return value is a find file handle for the current file search. Used for continuing a directory scan. A pointer to a WIN32_FIND_DATA structure; same idea as for FindFirstFile(). If the function succeeds, the return value is non-zero. If the function failed, the return value is zero, and you can get extended error information by calling the GetLastError() Win32 API function. Just like with file handles, you have to close the find file handle when you're done using it. You do that using the FindClose() Win32 API function. If the function succeeds, the return value is non-zero (TRUE); the return value is zero (FALSE), otherwise. You get the Windows system error code of the last error that occurred using this function. The Windows system error code for the last error. For more reference on these functions or structures, see references, at the end of this tutorial. We would define the dir_scan() function in this next example program. The dir_scan() function searches for files, passing its first argument to the FindFirstFile() function as the first parameter. For each item in the scan, it calls the callback function passed to it by the second argument. It passes its third argument (optional parameter) to the callback function as the second argument, and it passes the pointer to its WIN32_FIND_DATA structure to the callback function as the first argument. In our case, we use the optional parameter for the pointer to the string that collects all the names of the items in the directory. Every time our callback function is called, it appends the current item's filename to the string pointed to by our optional parameter. That way, we can just display a message box, after calling the dir_scan() function, with our string that's for filenames. ;; The following goes into the code section of the program; use 32-bit code. ;; Start program execution at this point. ;; Initialize the string to "" (blank). ;; Call the function that would scan through the directory listing. push eax                                ;; This is the optional parameter for the callback function. ;; We use the address of our new string for this parameter. 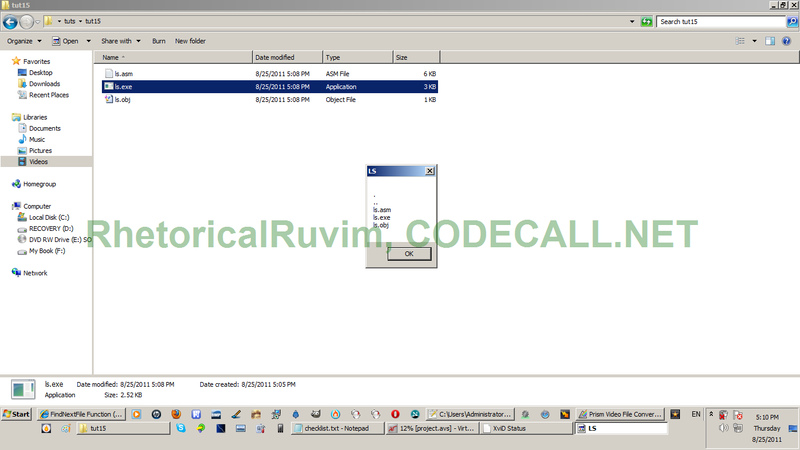 ;; function is called for each item in the directory scan. push dword file_search_string           ;; This is the path/string that is used for the search. ;; Now we display a message box with our new string. ;; The callback function has to be in the dir_scan callback format. ;;  		pFindData	A pointer to a WIN32_FIND_DATA (ANSI version) structure that contains the information about the item (ie file). ;;  		optParam	The optional parameter that was passed to dir_scan() as the third argument. mov eax, dword [ebp+08]                 ;; The pointer to the WIN32_FIND_DATA structure. add eax, 44                             ;; The offset of the filename part of the structure. push eax                                ;; The address of the filename (or directory name) string. push dword [ebp+12]                     ;; The optional parameter. ;; with the optional parameter. ;; Set [ebp-4] to the "\r\n" string. ;; Append that string to our other string that's passed by the optional parameter. ;; dir_scan() - Directory scan. ;;  	pFileSearchString	The directory or path, and the file name (wildcards are allowed). ;;  	pCallbackFunction	The address of the (dir_scan) callback function. ;;  	optCallbackParam	An optional parameter to pass to the callback function. ;; [ebp-318] = start of (ANSI version) WIN32_FIND_DATA structure. ;; [ebp-322] = hFindFile - find file handle. push eax                                ;; The pointer to the WIN32_FIND_DATA structure. push dword [ebp+08]                     ;; The file search string. mov dword [ebp-322], eax                ;; Save the handle to the file search. ;; Call the callback function. push dword [ebp+16]                 ;; The second argument is the optional parameter, passed to us earlier. push eax                            ;; The first argument is the pointer to the WIN32_FIND_DATA structure. call [ebp+12]                       ;; This function's second parameter is the address of the callback function. push eax                            ;; The address of the WIN32_FIND_DATA structure. push dword [ebp-322]                ;; The handle to the file search. cmp eax, 0                          ;; Error? jnz .lp1                            ;; If no, continue the loop. call [GetLastError]                 ;; This function takes no parameters and returns the system error code of the last error. cmp eax, 18                         ;; ERROR_NO_MORE_FILES = 18; means that there aren't any more files to scan. jz .lp1s                            ;; If no more files, break from the loop. ;; Otherwise, well, let's just close the hFindFile handle and return -1.
;; Close the find file handle. %include "../inc/str.asm"                   ;; Include the file with the string function definitions. ;; The following is for the data section. "." means the current directory, and ".." means the parent directory. %include "../inc/str.asm" ;; Include the file with the string function definitions. How I do to assemble this program without that file dependence ?